This is the 135 yard second shot that faces you on the 6th hole. If you have arrived at this position it means you avoided the trees left and right, and did not roll through the end of the fairway. 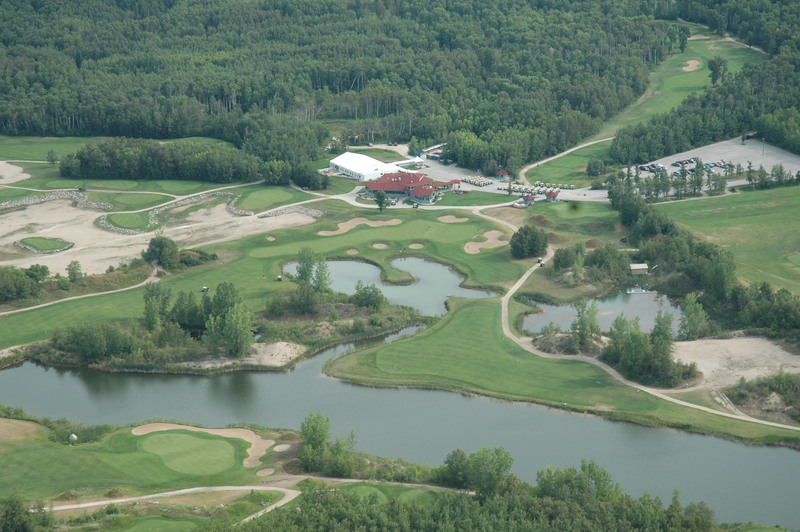 The Wildewood Golf Course located on North Drive in Fort Garry is a gem of a little golf course. I say ‘little’ only because it is a nine-hole course that is not particularly long at 6048 yards. I’ve had friends scoff at the idea of playing Wildewood, calling a ‘short little goat track’. I’ve frequently countered with an offer that if they can break 90 on the ‘goat track’ the first time they play it I’ll pay their greens fee and if they can’t break 90, they buy lunch. Over the past 25 years I’ve enjoyed many excellent lunches. So how can a course that plays at 6048 yards, has no water hazards and a limited number of bunkers be difficult? Don’t let the yardage fool you. 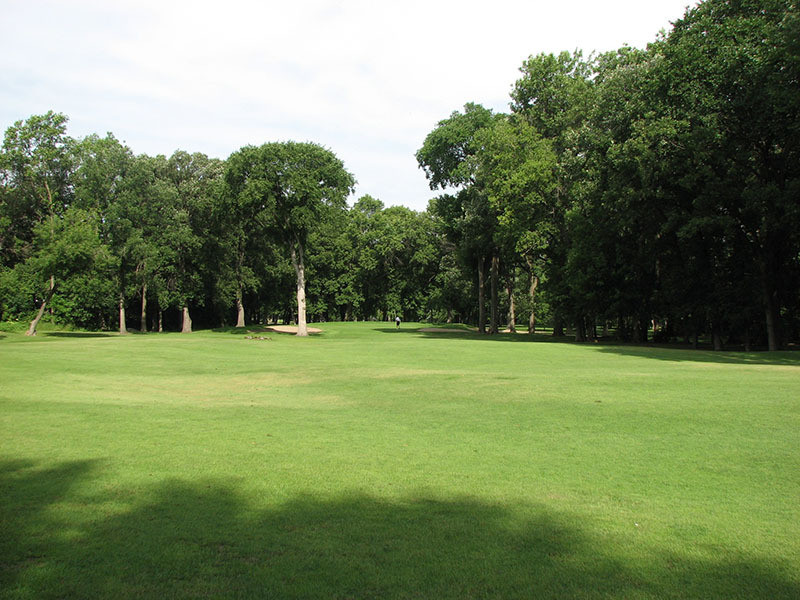 Because of the design of the course and the strategic placement of trees, a number located in the middle of fairways, it plays longer than the stated yardage and requires a unique approach in terms of scoring. Wildewood has trees. I mean literally hundreds if not thousands of trees. And they are not little trees, we are talking mature elms and oaks many in the range of 40 to 50 feet tall. Apart from the aesthetics, these trees provide shade and serve as a buffer on windy days. When I first joined Wildewood in 1990 one of the old timers who has since passed, advised me that either of two things would happen: Either I would learn to hit the ball straight or alternatively I would quit the game. I still don’t always hit it straight but neither have I quit the game. Wildewood is a regulation par 72 course with four par threes, 10 par fours, and four par fives. What makes it play longer is that for longer hitters the driver is not a good option on most of the par 4’s. Because you end up hitting a 3 wood or hybrid (if you are playing strategically) on the par 4’s you end up giving up anywhere from 30 to 50 yards on each of the par 4’s as compared to a wide open course where you can flail away with your driver on all the par 4’s. Virtually every fairway is tree-lined, on both sides of the fairway. In the case of the doglegs, tee shots must be curved to prevent entering the trees at the end of the fairways. These factors make it a difficult course to score on until you understand the course and develop a scoring strategy. Since first joining Wildewood in 1990 I’ve made my way around the course an estimated 3500 times. That is a lot of golf, but it’s also a lot of years and in those years I’ve managed to reduce my handicap from the 15-18 range down to the 3-5 range (and I’m stilled married to the same woman). If you have not played Wildewood you need to. Over the past several years the course has been very well maintained and it provides some unique challenges that few others courses can equal in terms of the scoring strategy required. In a subsequent post I will detail some of the strategies I use to score on Wildewood.